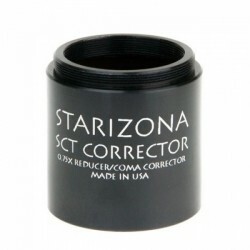 We have updated our popular SCT Corrector! By modifying the optical design of the SCT Corrector based on the 4-element design of our large-format SCT Corrector LF model, we were able to increase the focal reduction from f/7.5 to f/6.3 while preserving the optical performance and keeping the available backfocus the same. The diagram above shows how the SCT Corrector II improves the off-axis spot size on a Celestron 11" SCT. Performance is similar on other size telescopes. The exact focal length of the reducer/telescope combo depends slightly on where in the optical path the SCT Corrector lens is placed. Nominally it will be within a few mm of the rear threads on the telescope. Changing this distance should only affect the focal length, not the optical quality. Listed below are the nominal focal lengths for the various sizes of Celestron SCTs*. The SCT Corrector works great on standard f/10 Meade SCTs as well, we just didn't have exact data for the nominal designs of those telescopes. * The reduction ratio is different for the C6 and C8 because the nominal backfocus at f/10 of those telescopes is less than that for the larger scopes, so there is slightly less reduction. The C14 is slightly slower because it is natively f/11. The SCT Corrector II has a nominal image circle of 27mm, accommodating most popular CCDs and DSLRs. For larger format cameras, check out our SCT Corrector LF. The SCT Corrector II, like the original SCT Corrector, has a 2" barrel that allows it to fit into a 2" visual back or 2" focuser. If your telescope does not have such an adapter, we recommend our Virtual View rotating visual back, which allows for easily changing the camera orientation without loosening any lock screws. 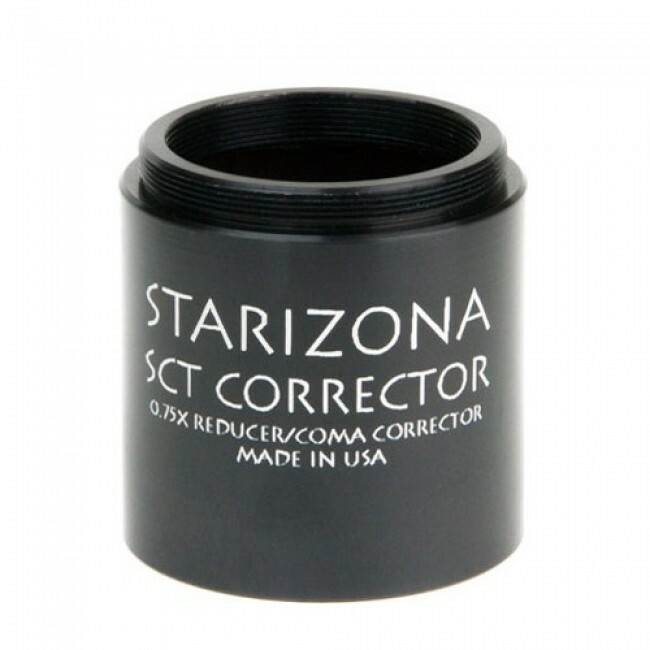 The front (telescope side) of the SCT Corrector II is threaded to accept standard 2" (48mm) filters.